Introduction. 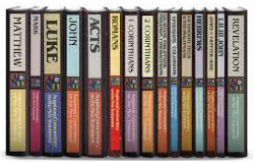 Originally created for a high school-level Bible study class, this downloadable series surveys the content of New Testament books in chronological order (when historical events likely occurred or when the various letters were likely written). The lessons consist only of a scripture assignment with questions to guide students in their study of the associated scriptures using their BIble and Bible study aids. There is no supplemental reading material. As a result, this survey is intended for a more mature audience (e.g., high school and above). > Lesson 17 The Crucifixion (pdf) (for more, see "Topics > C" for "Cross of Christ"
> Lesson 18 Triumph! (pdf) (for more, see "Topics > R" for "Resurrection"